Feeling overwhelmed with eating healthy? I totally get it. Eating healthy can be confusing and overwhelming. What should you make? How do you even cook healthy meals that taste good? When should you prep things? What kind of things should you be buying at the store? It’s a lot to handle. That’s why I created the 4 Weeks of Clean Eating Guide! Yes I need this guide! What is the 4 Weeks of Clean Eating Guide? The 4 Weeks of Clean Eating Guide is a 28 day plan complete with grocery lists, meal prep schedules, and exclusive recipes for breakfast, lunch and dinner. 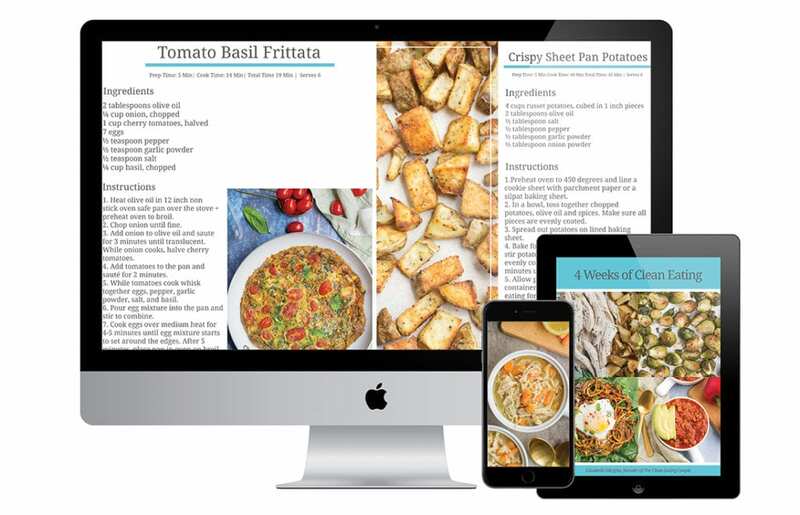 I specifically designed it so you could spend less money and time creating healthy meals! What kind of recipes are in this guide? All of the recipes in this guide are easy to follow and take minimal time. 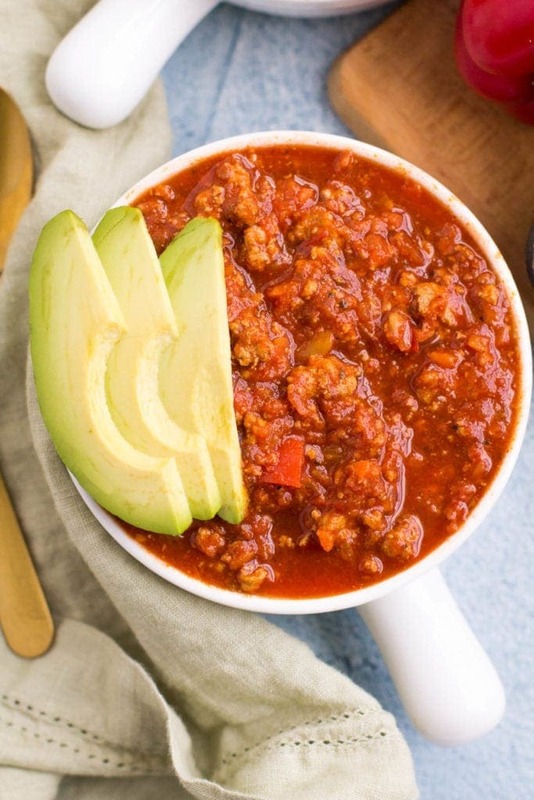 The recipes are all also Whole30™ friendly, paleo, gluten free, and dairy free. Even if you don’t follow a specific diet – you’ll LOVE these recipes, I promise. How much time will I be spending cooking with this guide? Each day varies in terms of time spent cooking. Most days you will spend less than 30 minutes in the kitchen. However, there are a few days where you will prep your breakfast in advance which will require a little bit more time. It’s totally manageable! How many people does this guide serve? This guide was designed to feed two people. You can double the recipes/grocery list if you have a larger family, or halve the recipes/grocery list if it’s just you! How much on average will I spend per week on groceries? The guide took all the work out of meal planning/grocery list making. Plus, I love that she worked using leftovers into her plan (big fans of leftovers over here.) The guide also took a lot of the stress away from Whole 30 and allowed me to enjoy the experience even more than I would have normally. For months, my husband and I talked about making big changes in the way we approached food in our home, but constantly felt SO overwhelmed by all of the different approaches to healthy eating. It seemed like most of the tips, tricks, and recipes we saw were more about what we couldn’t have rather than what we could, which made the thought of eating healthier even more intimidating. 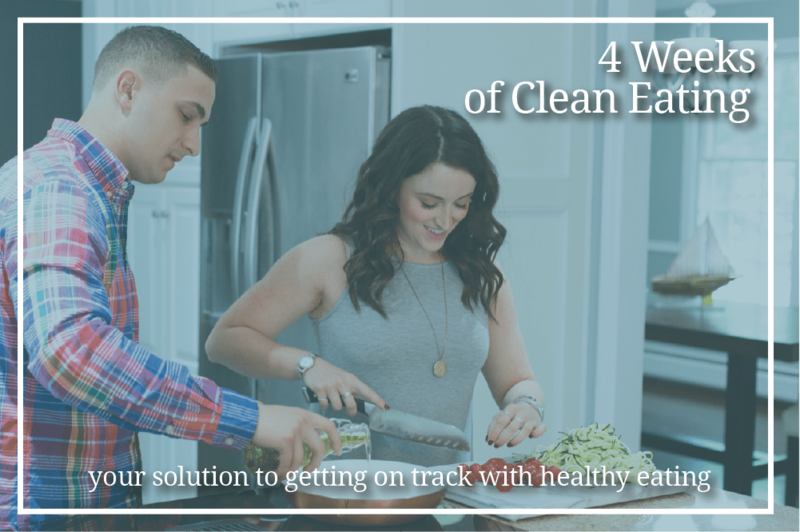 When I came across the 4 Weeks of Clean Eating Guide, though, I felt a confidence about healthier food choices that I felt like we could use as a great starting point towards a healthier lifestyle for our family. This guide has saved me a ton of time this week – time that I was able to spend playing with my kids, watching Christmas movies, relaxing with my husband. As a full time working mom this has been invaluable. I purchased this a couple weeks ago. I love every recipe that I’ve tried so far. I was skeptical about eating salad for breakfast lol. I have enjoyed my meals. Thank you Liz!! This guide is everything I needed. I am a full time worker, wife & a busy mom of a one year old. Time is very precious and always running short but this guide definitely helps with that. There is a wide variety of recipes in this book so you will never get bored. The shopping list is broken up to ease grocery shopping. Lastly, the instructions are so thorough and so easy to follow. My favorite recipes were the Sheet Pan Mustard Pork Tenderloin & Healthy Chicken Tenders.